Many key community organizations located in rural Minnesota towns such as Detroit Lakes, Luverne, Hinckley, and Wabasha report limited access to low cost high-speed broadband services. Enventis Telecom, as part of the Greater Minnesota Broadband Collaborative, proposes to construct a brand new 428-mile fiber network that would provide middle-mile service at speeds of up to 10 Gbps and enable connections to anchor institutions and businesses across a 23-county area of the state. The project intends to expand distance learning and training opportunities throughout the state, while offering high-capacity services to community organizations in the area. Among the anchor institutions already committed to working directly with the grantee and its partner the State of Minnesota’s Office of Enterprise Technology are the University of Minnesota at Duluth, Little Falls Police Department, and St. Gabriel’s Hospital. Enventis Telecom connected 16 community anchor institutions to its network through June 2013. 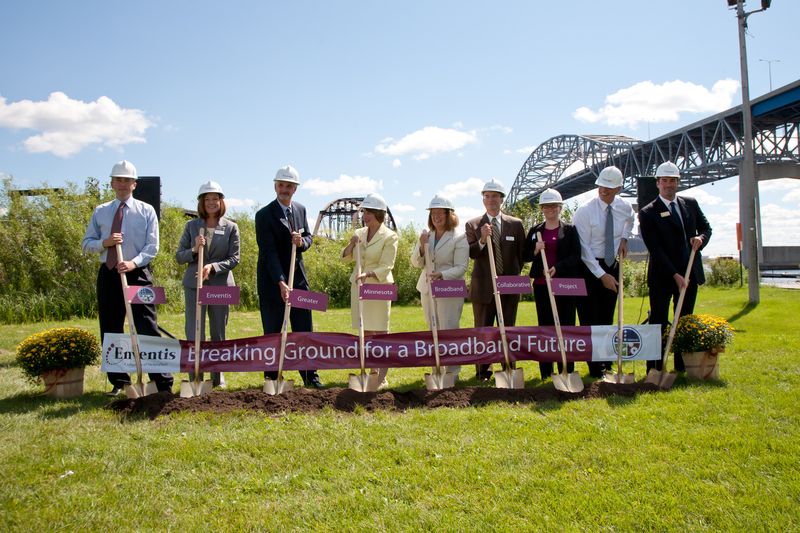 Enventis’ Greater Minnesota Broadband Collaborative project deployed an open access network to bring affordable high-capacity Ethernet services to rural areas of Minnesota. The project expanded distance learning and training opportunities throughout the state. It also built a modern healthcare network that interconnected approximately 10 regional health clinics, enabling the use of telemedicine and electronic medical records. The network utilized more than 400 miles of new fiber-optic infrastructure to connect more than 80 anchor institutions across a 23-county area of the state. The K-12 public schools, public safety entities, libraries, community colleges, higher education institutions, healthcare facilities, and government facilities received Internet at speeds of up to 10Gbps.